Parineeti Chopra & Ayushmann Khurrana upcoming Hindi movie Meri Pyaari Bindu film shooting in Kolkata, Parineeti & Ayushmann Meri Pyaari Bindu film shooting photos, Meri Pyaari Bindu film shooting locations (spots) in Kolkata, behind the screen (scene) pictures of Meri Pyaari Bindu, Parineeti shooting pics of Meri Pyaari Bindu shooting in Kolkata. Parineeti Chopra and Ayushmann Khurrana has began shooting in Kolkata for their upcoming Hindi movie 'Meri Pyaari Bindu' in May 2016. Bollywood actress Parineeti Chopra and actor Ayushmann Khurana will be seen together for the first time. Parineeti Chopra was seen last in 'Kill Dill' and Asyushmann Khurrana in 'Dum Laga Ke Haisha'. First week of May 2016, Parineeti Chopra and Ayushmann Khurrana started shooting of Meri Pyaari Bindu movie in Kolkata under the direction of Akshay Roy. Meri Pyaari Bindu cinema heroine Parineeti Chopra shared few film shooting snaps on her social network, let's check out those Meri Pyaari Bindu film shooting photos taken in Kolkata. 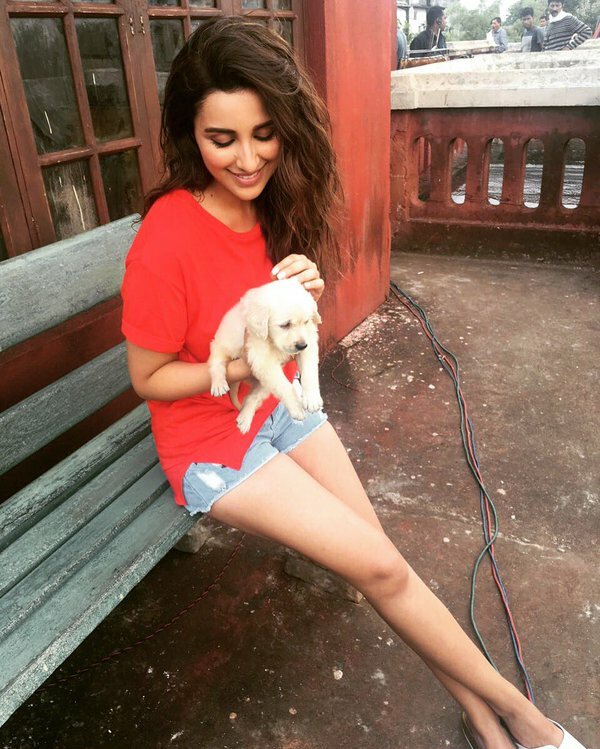 Hindi film actress Parineeti Chopra (Bindu) with Devdas (little puppy) during shooting of Meri Pyaari Bindu in Kolkata. Parineeti Chopra starts 'Meri Pyaari Bindu' shoot in Kolkata along with Ayushmann Khurrana. Both are immensely talented and loving every bit of shooting in Kolkata. In the film 'Meri Pyaari Bindu', Ayushmann Khurrana to play 'Abhimanyu' and Parineeti Chopra to play a South Indian girl 'Bindu' staying in Calcutta (Bengal). Thus, Meri Pyaari Bindu fim shooting is going on in North Kolkata [Old Calcutta]. 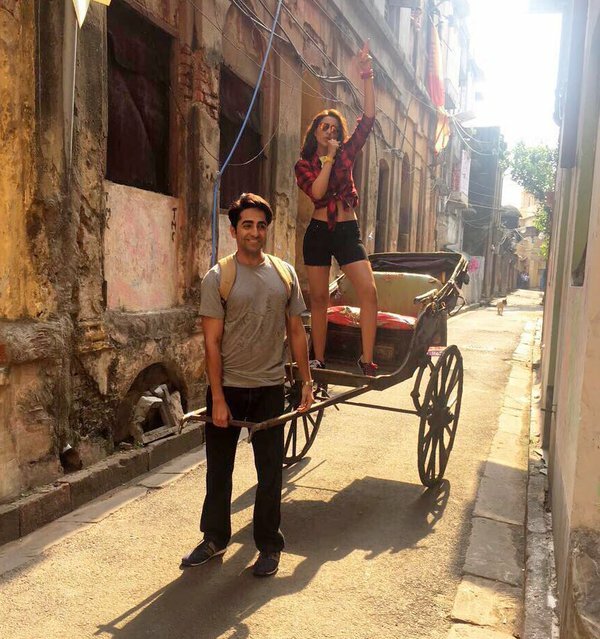 Bindu (Parineeti) and Abhimanyu (Ayushmann) enjoying during Meri Pyaari Bindu film shooting on old Calcutta streets. Meri Pyaari Bindu film Director: Akshay Roy. Meri Pyaari Bindu film Producer: Maneesh Sharma. Parineeti Chopra (Bindu) is riding cycle in Kolkata during Meri Pyaari Bindu film shooting at famous Shyambazaar area. Saif Ali Khan & Sonakshi Sinha, pairing together for the first time, is now busy shooting their next film Bullet Raja. Bollywood actor Saif Ali Khan and actress Sonakshi Sinha is in Kolkata for their upcoming Hindi film Bullet Raja, which is a Gangster Thriller film. Saif Ali Khan has done shooting in Kolkata before also. One of his films Parineeta was shot in Kolkata. But, it’s the first trip to Kolkata for Sonakshi Sinha with the purpose of film shooting. Sonakshi Sinha (inside the Tram) & Saif Ali Khan. Saif Ali Khan & Sonakshi Sinha is going to be seen in Hindi Movie Bullet Raja for the first time and few scenes of the movie will be shot in Kolkata [mostly in North Kolkata’s Bonedi Houses]. 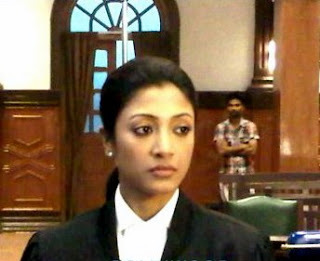 Few scenes on tram, hand-pulled Rickshaw & other locations of Kolkata are going to be shot. As per the news, this upcoming movie Bullet Raja starring Saif Ali Khan & Sonakshi Sinha will be released at the end of this year or first of next year. Bollywood Hindi film Khiladi 786 movie casting director producer cast of Khiladi 786 release date book buy tickets online Hindi Khiladi 786 Akshay Kumar & Asin, Khiladi 786 Akshay Kumar & Asin, Hindi cinema halls showing Khiladi 786 Kolkata Bengal show timings upcoming Hindi cinema Khiladi 786 watch online. 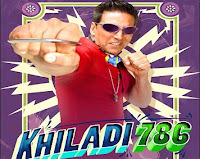 • Khiladi 786 Hindi movie Director Name: - Ashish R. Mohan. • Khiladi 786 Hindi movie Producer name: - Sanjay Bali, Twinkle Khanna, Sunil Lulla and Himesh Reshammiya. • Khiladi 786 Hindi movie Music Director Name: - Himesh Reshammiya. • Khiladi 786 Hindi film Casts Actors Actresses: - Akshay Kumar, Asin, Raj Babbar, Vipin Bakshi, Swantatra Bharat, Mithun Chakraborty, Sorabh Chauhan, Johnny Lever, Paresh Rawal, Himesh Reshammiya, Mukesh Rishi, Bharati Singh and many others. • Khiladi 786 Hindi movie Release Date: - 7th December 2012. • Cinema Halls showing Khiladi 786 Hindi movie: - After a long time Akshay Kumar is back as ‘Khiladi’ and the movie Khiladi 786 released on 7th December 2012. Let’s check out the Cinema Hall names Showing Khiladi 786 in Kolkata & West Bengal – Paradise, Ellite, Basusri, Naveena, Talkies Show House, Purabi, Moonlight, Jagat, Ragini, Bina, Elora, Mahua, Ashoka, Inox [Forum, City Centre, Swabhumi, Rajarhat, Liluah, Burdwan, Durgapur, Siliguri-1 & 2, Darjeeling], FAME [Hind, South City, Hiland Park], PVR Avani Mall Howrah, London Paris Ballygunje, Broadway Salt Lake, Bioscope Rajarhat, Bioscope (Durgapur), Jaya (Lake Town & Barasat), Cinemax (Mani Square, Siliguri), Big Cinema (Salt Lake Sector V), Ajanta (Behala), Jayanti (Barrackpore), Malancha, Eylex (Asansol), Sonali (Dunlop), Chetana, Tasveer Mahal (Rajabazar), Khatun Mahal, Kamal (Metiabruj), Atindra, Debasri, Bijoya, Lali (Barasat), Jyoti, Naba Bharat, Liluah Cinema, Sujata (Dasnagar), Milan (Baruipur), Lila (Baruipur), Mini Sushma, Surendra, Swapna (Andul, Haripal), Shankar (Habra), Sankar (Purulia), Gitanjali (Bolpur), Balaka (Ilambazar), Srirampore Talkies, Kristi (Memari), Shibani (Bagnan), Birbhum Talkies, Jayanti (Rishra), Bharati (Chakdah), Burdwan Cinema, Sri Lakshmi (Kanchrapara), Chitra (Asansol), Sanskriti Metro (Burdwan), Durgapur Cinema, Sanhati Mancha, Anjana (Ranigunje), Chitra (Bolpur), Satyajit Mancha (North Bengal), Kaliagunje Talkies and many other cinema halls in Kolkata & Bengal will show Khiladi 786 Bollywood movie on & from 7th December 2012. New Hindi movie / Bollywood film Khiladi 786 of Akshay Kumar & Asin seems to be worth watching in Cinema Hall; so start buy tickets online of Khiladi 786 from www.bookmyshow.com website. Ranveer Singh, young talented star actor of Bollywood, has produced back to back super hit Bollywood Movies titled ‘Band Baja Baarat’ & ‘Ladies vs Ricky Behl’ and now busy making muscular physique for his upcoming Hindi film. Ranveer Singh’s next film named ‘Gunday’ to be shot in Kolkata. Priyanka Chopra, Arjun Kapoor are the other star actors of Ranveer Singh’s upcoming Hindi film Gunday directed by Ali Zaffar. If you are not aware of Ranveer Singh’s Gunday movie then check it now. We are here to inform you about another upcoming Hindi Movie of Ranveer Singh in 2013 apart from Gunday Hindi Movie [that also going to be released in 2013]. Actor Ranveer Singh is now busy improving his physique only because of his next Hindi Cinema Ram Leela. Renowned film-maker Sanjay Lila Bansali featured Ranveer Singh in his Ram Leela Hindi Movie; but he wants Ranveer Singh to have muscular body with few packs; so that female fans become crazy to see him making romantic scenes on screen. This is the New look of actor Ranveer Singh for Ram Leela Hindi film directed by Sanjay Lila Bansali. Get ready, slim trim lover boy Ranveer Singh is coming with three films in 2013 and the upcoming Hindi films of Ranveer Singh are ‘Lootera’, ‘Gunday’ & ‘Ram Leela’ to be released in 2013. Film Director Anurag Basu, who have directed back to back super duper hit Hindi Films over the years, is now busy with his next Bollywood film based on a true story. One of the best Film Directors of Bollywood Film Industry Anurag Basu had directed block-bluster hits like ‘Life in a Metro’, ‘Gangster’ and ‘Barfi’. Anurag Basu’s Barfi film, released on 14th September 2012, was the biggest hit and nominated for prestigious OSCAR Awards. But film-maker Anurag Basu is not in a mood of taking a break. He is now busy with his next project after ‘Barfi’. As per the news, Film Director Anurag Basu is going to make a film based on real life true story of Anand Kumar of Patna (Bihar). The upcoming movie of Anurag Basu is on Anand Kumar’s Super 30 Coaching Centre of Patna. Anand Kumar, who had the chance to study at Cambridge University but failed for his financial condition, owns 'Super 30 Coaching Centre' at Patna & helps meritorious financially weak candidates to get admission at IIT. Every year Anand Kumar arranges accommodation, foods & educational training for 30 students at ‘Super 30 Coaching Centre’. As of now, around 263 students successfully admitted to IIT (Indian Institutes of Technology) through Super-30 Coaching Centre of Anand Kumar. Film Director Anurag Basu also failed to get admitted to IIT during his educational life and thus when he came to know about this amazing work of Anand Kumar, who helps financially weak students to get admission in IIT, he made-up his mind to make a film on this. Few years back, a Documentary film of one hour was made on Anand Kumar’s Super-30 Coaching Centre located at Patna (Bihar) and was telecast on Discovery Channel as well. But, making a movie on Anand Kumar’s Super-30 never happened before. 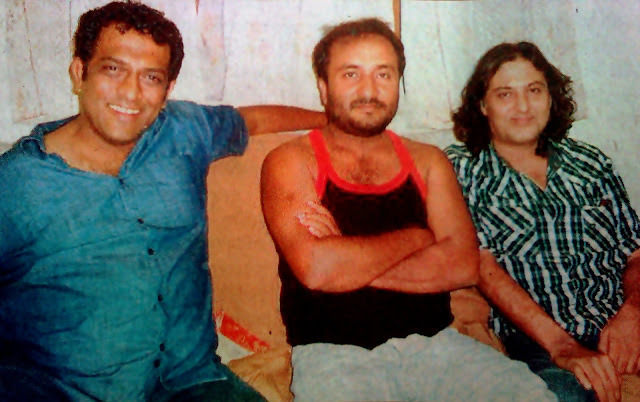 Filmmaker Anurag Basu along with Sanjib Dutta (Script writer) visited Anand Kumar’s residential house & Super-30 Coaching Centre of Patna in October 2012. Story, Casts & name of the film not yet finalized; but one thing for sure; Anurag Basu is going to make a film on Anand Kumar’s Super-30. The story could be on Anand Kumar’s life or on ‘Super 30 Coaching Centre’. Get ready for another real life storied super hit movie of Anurag Basu in 2013 or 2014. Bollywood Hindi film Heroine movie casting director producer cast of Heroine release date book buy tickets online Hindi Heroine Kareena Kapoor, pictures wallpapers download of Heroine Kareena Kapoor, Cinema halls showing Heroine Kolkata Durgapur Siliguri Asansol Howrah Heroine show timings Hindi cinema Heroine watch online. • Heroine Hindi movie Director Name: - Madhur Bhandarkar. • Heroine Hindi movie Producer name: - Ronnie Screwvala. • Heroine Hindi film Casts Actors Actresses: - Kareena Kapoor, Arjun Rampal, Randeep Hooda, Shahana Goswami, Amrita Raichand, Divya Dutta, Lillete Dubey & many others. • Heroine Hindi movie Release Date: - 21st September 2012 [It’s also the Birthday of Kareena Kapoor, whose age is now 32 years]. Heroine Movie Show Timings at Kolkata’s Multiplex Inox Forum [9am, 10:10am, 11:50am, 1:10pm, 2:45pm, 4:10pm, 5:40pm, 7:10pm, 8:35pm, 10:10pm, 11:30pm]. Heroine Movie Show Timings at Kolkata’s Multiplex Inox Salt Lake City Centre [9, 10, 11:50, 13, 14:45, 17:40, 18:35, 20:35, 21:30, 22:40, 23:30]. Heroine Movie Show Timings at Kolkata’s Multiplex Inox Swabhumi [9:45, 11:15, 12:40, 15:35, 16:30, 18:30, 19:30, 21:30, 22:30]. Heroine Movie Show Timings at Kolkata’s Multiplex Inox Rajarhat [9, 10:15, 11:50, 13:15, 14:45, 17:40, 18:35, 20:35, 21:30]. Heroine Movie Show Timings at Howrah’s Multiplex Inox Liluah [9, 11:50, 14:45, 17:45, 19:40, 20:45, 22:30]. Other cinema halls in Kolkata showing Heroine film are FAME [South City, Hiland Park, Hind], Jaya Lake Town, Jaya City Mall Barasat, London Parris of Ballygunj Kolkata, CineMax Kolkata, Broadway Salt Lake. There are many more cinema halls showing Heroine movie in Kolkata & West Bengal other than these Multiplexes. New Hindi movie / Bollywood film Heroine of Kareena Kapoor seems to be worth watching in Cinema Hall; so start buy tickets online of Heroine from www.bookmyshow.com website. Bollywood Hindi film Barfi movie story review casting director producer cast of Barfi release date book buy tickets online Hindi Barfi Ranbir, Priyanka, pictures wallpapers download mp3 songs Barfi Ranbir, Priyanka, Hindi movie review plot shooting location cinema halls showing Barfi Kolkata Bengal show timings upcoming Hindi cinema Barfi watch online details information. • Barfi Hindi movie Director & Story Writer Name: - Anurag Basu. • Barfi Hindi movie Producer name: - Ronnie Screwvala, Siddharth Roy Kapoor. • Barfi Hindi film Casts Actors Actresses: - Ranbir Kapoor, Priyanka Chopra, Ileana D'Cruz, Jishu Sengupta and many others. • Barfi Hindi movie Release Date: - 14th September 2012. • Shooting Location Spot of Barfi Hindi Cinema: - Kolkata, Howrah, North Bengal and abroad. • Cinema Halls showing Barfi Hindi movie: - Let’s check out the Cinema Halls in Kolkata showing Barfi Bollywood Film along with Show Timings – Roxy [12noon, 3pm, 6pm & 9pm], Priya [4:40pm & 9:30pm], Menoka [3:15pm], Naveena [12noon & 5pm], Star Theatre [3pm & 8:45pm], Jaya Lake Town [11:30am, 4:45pm & 7:30pm], Ajanta Behala [11am, 1:40pm & 6:30pm], Ashoka Behala [5pm], Malancha [2:30pm], Jayanti Barrackpore [11:45am, 2:30pm, 5:15pm], Mini Sushma and many other cinema halls in Kolkata showing Barfi. Let’s check out the names of Multiplexes showing Barfi movie – Inox [Forum, City Centre, Swabhumi, Rajarhat, Liluah, Burdwan, Durgapur, Darjeeling, Siliguri 1 & Siliguri 2], FAME [Hind, South City, Hiland Park], Big Cinemas (Salt Lake), London Parris (Mukti World, Ballygunje Phari – 9:30am, 12:25pm, 3:20pm, 6:15pm & 9:10pm), Broadway (Salt Lake), CineMax (Manisquare & Siliguri), Jaya City Mall (Barasat), PVR Cinemas (Avani Mall, Howrah), Eylex (Asansol), Bioscope (Axis Mall Rajarhat, Junction Mall Durgapur) and others. New Hindi movie / Bollywood film Barfi of Ranbir, Priyanka seems to be worth watching in Cinema Hall; so start buy tickets online of Barfi from www.bookmyshow.com website. Bollywood Hindi film Aiyaa [Aiyyaa] movie story review casting director producer cast of Aiyaa [Aiyyaa] release date book buy tickets online Hindi Aiyaa [Aiyyaa] Rani Mukherji & Prithviraj Sukumaran, pictures wallpapers download mp3 songs Aiyaa [Aiyyaa] Rani Mukherji & Prithviraj Sukumaran, Hindi movie review plot shooting location cinema halls showing Aiyaa [Aiyyaa] Kolkata Bengal show timings upcoming Hindi cinema Aiyaa [Aiyyaa] watch online details information. Rani Mukherjee is back with Aiyyaa (Aiyaa) Hindi film, story writer & co-producer Anurag Kashyap, directed by film-maker Sachin Kundalkar. Aiyyaa (Aiyaa) Hindi Film starring Rani Mukherjee & Malayalam Film star actor Prithviraj Sukumaran is going to release in October 2012. Actress Rani Mukherjee has done three item numbers in Aiyaa (Aiyyaa) film and she took each one to extreme. Rani Mukherjee took Marathi Language Training classes & learnt Marathi to portray the Marathi Girl character and also learnt Belly Dancing that she has done in Dreamum Wakeupum item number. • Aiyaa [Aiyyaa] Hindi movie Director Name: - Sachin Kundalkar. • Aiyaa [Aiyyaa] Hindi movie Producer name: - Anurag Kashyap, Viacom-18 Motion Pictures, and G. Monga. • Aiyaa [Aiyyaa] Hindi movie Music Director Name: - Amit Trivedi. • Aiyaa [Aiyyaa] Hindi film Casts Actors Actresses: - Prithviraj Sukumaran [South Indian (Malayalam) Film super star actor], Rani Mukherji and many others. • Aiyaa [Aiyyaa] Hindi movie Release Date: - 12th October 2012. • Aiyaa [Aiyyaa] Hindi movie Story Review: - Rani Mukherjee is playing the lead role of a Marathi Girl and the story of Aiyyaa (Aiyaa) film is about her. It's a story of a woman who finds a man desirable only because he smells well. Aiyaa (Aiyyaa) film is basically a mixture of Reality & Dream of a Marathi girl. You will get to see a typical story of West-South Divide & Cultural clash. Marathi Girl Rani Mukherjee obsessed with South Indian Films and falls in love with a Malayali character played by Prithviraj Sukumaran. Rest of the story; you should watch in Cinema Hall nearest to you. One thing for sure, you will be entertained - Watch Dreamum Wakeupum Full Video Song from Aiyaa Movie. • Cinema Halls showing Aiyaa [Aiyyaa] Hindi movie: - Will be updated soon. New Hindi movie / Bollywood film Aiyaa [Aiyyaa] of Rani Mukherji & Prithviraj Sukumaran seems to be worth watching in Cinema Hall; so start buy tickets online of Aiyaa [Aiyyaa] from www.bookmyshow.com website. Bollywood Hindi film Gunday movie story review casting director producer cast of Gunday release date book buy tickets online Hindi Gunday Ranveer Singh & Arjun Kapoor, pictures wallpapers download mp3 songs Gunday Ranveer Singh & Arjun Kapoor, Hindi movie review plot shooting location cinema halls showing Gunday Kolkata Bengal show timings upcoming Hindi cinema Gunday watch online details information. Yash Raj Films presenting upcoming Bollywood movie Gunday which was shoot in Kolkata. After the great success of Sujay Ghosh’s Kahaani, Anurag Basu’s Barfi; ‘city of joy – Kolkata’ is becoming an important location to the film-makers. In the movie Gunday, actor Ranveer Singh [famous for ‘Band Baaza Baraat’] and actor Arjun Kapoor [made his film debut in ‘Ishaqzade’] will be seen the roles of ‘Gunday’. • Gunday Hindi movie Director Name: - Ali Abbas Zafar. • Gunday Hindi movie Producer name: - Aditya Chopra. Tollywood film producer Arindam Seal has done the production job during the film shoot at Kolkata. • Gunday Hindi movie Choreographer name: - Bosco-Ceaser. • Gunday Hindi film Casts Actors Actresses: - Ranveer Singh, Arjun Kapoor & others. The lead female actress name not yet confirmed by the director & producer of Gunday movie [as of August 2012]. • Gunday Hindi movie Release Date: - in 2013. • Gunday Hindi movie Story Review: - Bollywood movie Gunday is about two friends Bikram & Bala Rose [characters played by Ranveer & Arjun]. The story of Gunday is portraying ‘Calcutta’ city during the period 1971-1988. How small thieves became the biggest & most powerful mafia - the story is all about that. • Shooting Location Spot of Gunday Hindi Cinema: - Most the Gunday film was shot in Kolkata as per the story requirement. You will get to see Bhawanipur area, Kumortuli area, Shalimar Railway Yard, Howrah Station and River Ganga in the Bollywood movie Gunday. Total of 50-days started in December 2012 taken to shoot the film in Kolkata. Line Producer of Gunday movie Arindam Seal informed that a dance sequence was shoot in the middle of Ganga with more than 100s of dancers. Isn’t it exciting? • Cinema Halls showing Gunday Hindi movie: - will be updated later. New Hindi movie / Bollywood film Gunday of Ranveer Singh & Arjun Kapoor seems to be worth watching in Cinema Hall; so start buy tickets online of Gunday from www.bookmyshow.com website. Bollywood Hindi film Ek Tha Tiger movie story review casting director producer cast of Ek Tha Tiger release date book buy tickets online Hindi Ek Tha Tiger Salman Khan & Katrina Kaif, pictures wallpapers download mp3 songs Ek Tha Tiger Salman Khan & Katrina Kaif, Hindi movie review plot shooting location cinema halls showing Ek Tha Tiger Kolkata Bengal show timings upcoming Hindi cinema Ek Tha Tiger watch online details information. Salman Khan & Katrina Kaif paired after a long gap. ‘Yuvraaj’ was the last film where Salman Khan & Katrina Kaif was seen together although the movie didn’t do well in the box-office. This time, the pair has come up with their new film ‘Ek Tha Tiger’ released on 15th August 2012. Let’s check out the castings & crew member names of Ek Tha Tiger and the Cinema Hall names of Kolkata & West Bengal where Ek Tha Tiger movie will be shown. • Ek Tha Tiger Hindi movie Director Name: - Kabir Khan. • Ek Tha Tiger Hindi movie Producer name: - Aditya Chopra. • Ek Tha Tiger Hindi movie Music Director Name: - Sajid-Wajid. • Ek Tha Tiger Hindi movie Lyricist name: - Kausar Munir. • Ek Tha Tiger Hindi movie Release Date: -15th August 2012. • Cinema Halls showing Ek Tha Tiger Hindi movie: - Let’s check out few Cinema Hall names in Kolkata & various areas of West Bengal where Ek Tha Tiger Hindi Movie will be shown on & from 15th August 2012 – Cinema Halls Showing Ek Tha Tiger Movie in Kolkata are Elitte, New Empire, Menoka, London Parris (Ballygunj), Naveena, Star, Talkie Show House, Jaya (Lake Town), Jaya City Mall (Barasat), Malancha, Ashoka, Ajanta, Gitasri (Rajarhat), Mayur, Moonlight, Bina, Jagat, Purabi, Kamal, Mahua, Ragini, Sonali (Dunlop), Atindra (Barrackpore), Jayanti (Barrackpore), Chetana (Dumdum), Lali (Barasat), Rathindra-1 (Sodepur), & many others. Multiplexes Showing Ek Tha Tiger in Kolkata & Bengal are Inox [Forum, City Centre, Swabhumi, Rajarhat, Liluah, Burdwan, Durgapur, Siliguri-1, Siliguri-2, Darjeeling], Fame [Hind, South City, Hiland Park], PVR Avani Mall (Howrah), CineMax (Manisquare, Siliguri), Big Cinema (Salt Lake), Broadway (Salt Lake), Ilex (Asansol), & many others. Cinema Halls in Bengal’s various districts showing Ek Tha Tiger Bollywood Movie are Chandan (Liluah), New Bharat (Howrah), Lipi (Shibpur), Shanti (Howrah Kadamtala), Sujata (Howrah Dasnagar), Shibani (Bagnan), Mini Sushma (Sheoraphully), Sushma (Sheoraphuli), Netaji Bhawan (Mahesh Srirampur), Jayanti (Rishra), Ramakrishna (Kalagachia), Diamond Talkies (Diamond Harbour), Alochaya (Nabadwip), Chitra (Bolpur), Mumpi (Rampurhat), Apsara (Beniagram), Lila (Baruipur), Birbhum (Suri), Rupchaya (Berachampa), Rupchabi (Domjur), Purbasha (Machlandapur), Shankar (Habra), Miloni (Basirhat), Flaguni (Basirhat), Hari (Medinipur), Narendra (Uluberia), Nataraj (Ashoknagar), Shyama (Bisnupur), Sudhanil (Arambag), Lok Sanskrity (Burdwan), Gouri (Falakata), Amar (Alipurduar), Rupkatha (Malda), New Cinema (Siliguri), Payel (Siliguri), Ritwik Sadan (Berhampore), Bombay (Kharagpur), Manoj (Asansol), Srirupa (Kanthi), Rajani (Jagaddal) and many many more cinema halls showing Ek Tha Tigher Movie on & from 15th August 2012 in West Bengal. Ek Tha Tiger Movie Show Timings at Big Cinemas RDB Salt Lake - 10am, 11:45am, 12:15pm, 1pm, 2:45pm, 4pm, 5:45pm, 6:15pm, 7pm, 8:45pm and 10pm [schedule can be changed]. You can book your tickets by a phone call and for Telebooking please call 033-39894040 phone number. New Hindi movie / Tollywood film Ek Tha Tiger of Salman Khan & Katrina Kaif seems to be worth watching in Cinema Hall; so start buy tickets online of Ek Tha Tiger from www.bookmyshow.com website.